Pre-Thanksgiving time always brings out the best in beautiful Bougainvillea, and we will have huge Hanging Baskets at Saturday Morning Market this weekend. 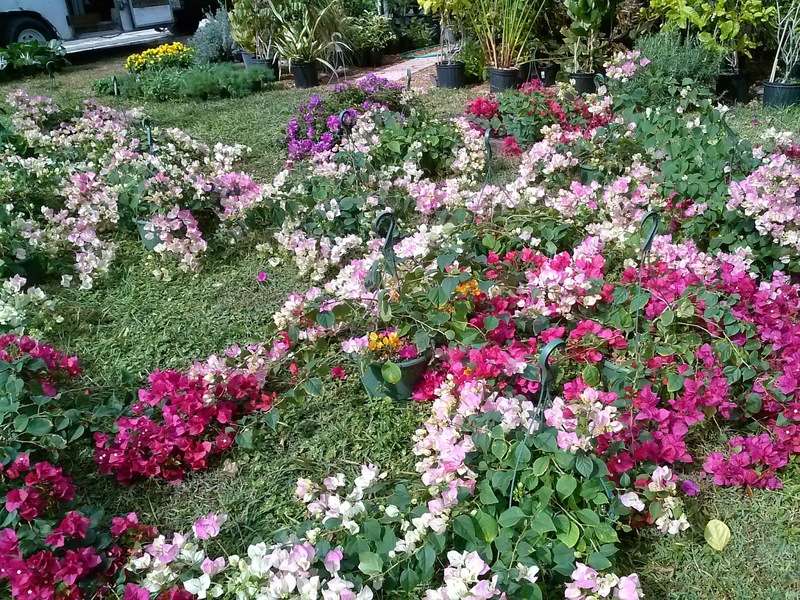 < A "sea" of Bougainvillea staged and ready to be loaded on the trailer. Bougainvillea love sun, dry conditions and fertilizer, and these hanging baskets make a dramatic statement and are EZ to care for if you have the right spot ! 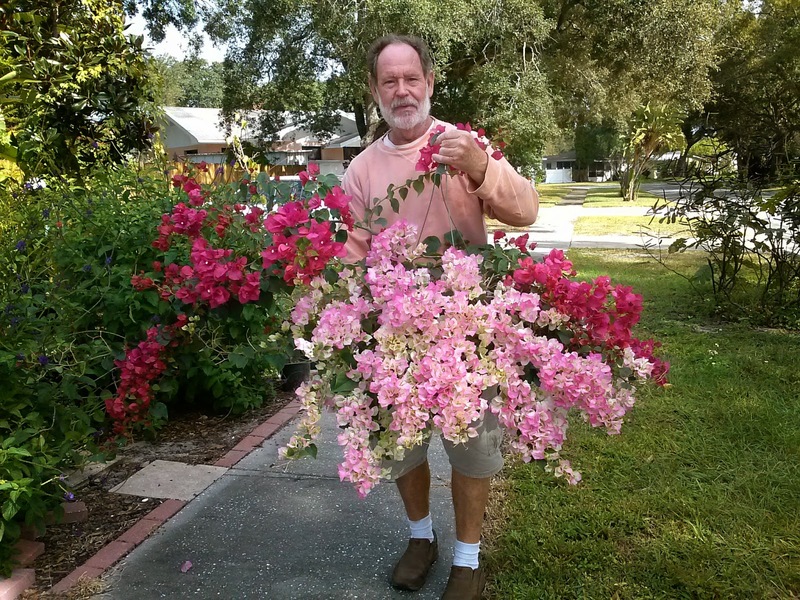 At right, is Mitch with one of our largest baskets...yes, its' one basket, in multi colors ! Our baskets are priced from $20 - $30 this week, so come on out early for the best choice. 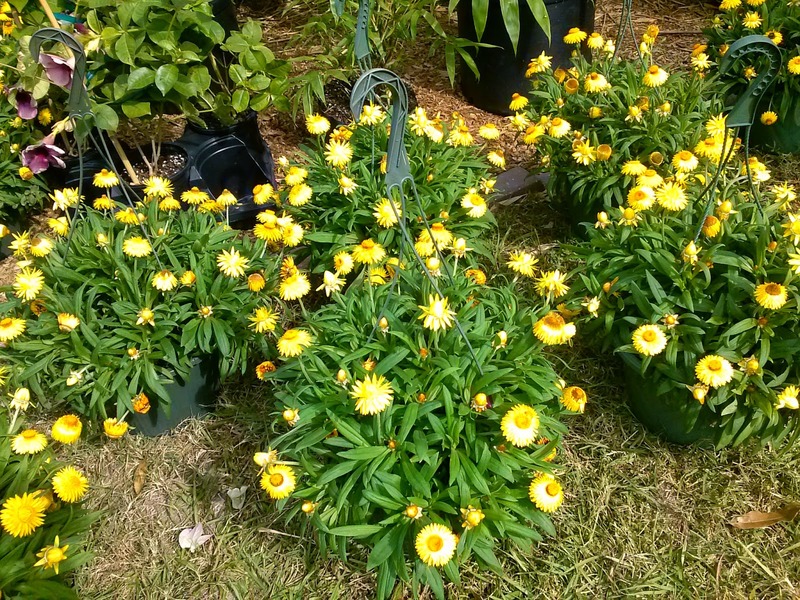 Also at Market this week, we have the popular Yellow Straw Flower Baskets. Loving this time of year, they will give hearty color all the Fall and Winter months. Loving sun, and drying out in between watering, the flowers are so unique....they close up at night, and open with the sun each morning, and the cut flowers last for months ! This pre-Thanksgiving Market is also a great day to stock up on hardy Herbs for your porches and gardens, and just in time to have fresh herbs to use in Holiday cooking, such as Parsley, Sage, Rosemary, Thyme, Mint, Oregano and Lavenders.